Diversification – everybody’s familiar with the concept and all of it’s benefits, but just to be sure we are on the same page I have plotted a quick chart to outline the notion. This is a critical chart to understand. With Risk as our vertical axis and the number of holdings as our horizontal axis, you can see the theoretical relationship. 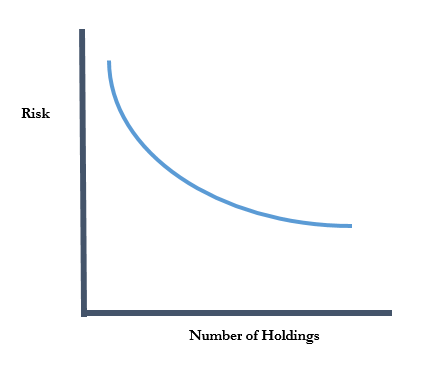 As the number of holdings increases, the level of risk inside a portfolio should decrease but at a diminishing rate. The Diversification conversation is usually one-sided focused on nothing but the benefits – And that’s a problem. We assume by increasing the number of holdings we are setting ourselves up to receive all the benefits diversification has to offer. In reality, we should recognize the costs as well, and if not thought about critically, we are going to experience more of those than we would like. The costs of improper diversification are evident through diminished returns and the absence of any real risk reduction capability. Don’t add holdings under the assumption you are reducing risk, you have to understand how holdings relate to one another. While you may own 10 different ETFs, mutual funds, or whatever it may be, it’s in a market sell off where you realize they’re all the same thing. Small Caps, Mid Caps, Large Value – they are all stocks. It’s critical to make proper assets allocation decisions on the front end. Every portfolio should be built with the objective of sufficient expected returns given the appropriate risk constraints. Diversification should be a part of that construction process. But, the process should begin with a thorough examination of each holdings expected returns and relationship to one another. The benefits should outweigh the costs, not the other way around. That’s true diversification, and yes, it’s the only free lunch in town.